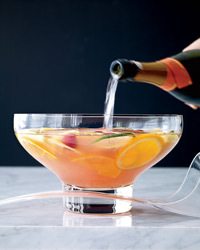 In a large punch bowl, combine the fruit, Gin 33, lemon juice, simple syrup, orgeat syrup and framboise liqueur. Just before serving, stir in the chilled Prosecco and add a super-size ice block. Recipe adapted from Allen Katz’s Punch Parker.